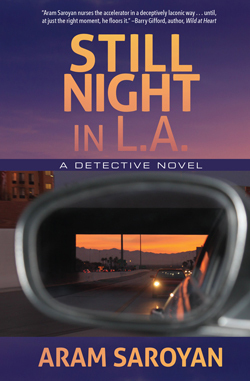 Michael Shepard, a detective with his own set of problems, is hired one morning by a fashionable young woman at her Hollywood apartment. Soon he’s embroiled in a murder investigation that may shed light on a nearly forgotten tragedy. A divorced father wondering how to set his son on a better course in life, the detective gets into deepening trouble as he negotiates a vivid panorama of the town’s modern-day beautiful and damned. Author Aram Saroyan harnesses the hardboiled styles of Chandler, Hammett, and Ross MacDonald into a contemporary tale of information age intrigue. The text is supplemented with cell phone photos taken by Saroyan in the same environs in which the story unfolds. Aram Saroyan is an internationally known poet, novelist, biographer, memoirist and playwright. The recipient of two National Endowment for the Arts poetry awards, Saroyan is also the author of the best sellers Trio and Rancho Mirage. He lives in Los Angeles with his wife, painter Gailyn Saroyan. Aram Saroyan, author of Still Night in L.A. 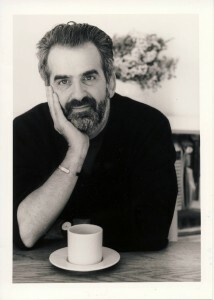 Award-winning author Aram Saroyan is an internationally known poet, novelist, biographer, memoirist and playwright. His poetry has been widely anthologized and appears in many textbooks. Among the collections of his poetry are Aram Saroyan and Pages (both Random House), and his largest collection, Day and Night: Bolinas Poems, (Black Sparrow Press). Saroyan’s prose books include Genesis Angels: The Saga of Lew Welch and the Beat Generation; Last Rites, a book about the death of his father, the playwright and short story writer William Saroyan; Trio: Portrait of an Intimate Friendship; The Romantic, a novel that was a Los Angeles Times Book Review Critics’ Choice selection; a memoir, Friends in the World: The Education of a Writer; and the true crime Literary Guild selection Rancho Mirage: An American Tragedy of Manners, Madness and Murder. He is featured in the documentary film One Quick Move or I’m Gone: Jack Kerouac at Big Sur and his comments appear in the oral biographies George Being George: George Plimpton’s Life and Salinger. He lives in Los Angeles with his wife, painter Gailyn Saroyan. For a complete press kit, or to interview Aram Saroyan, or to book Aram Saroyan for an event or reading, please contact Peter Carlaftes at Three Rooms Press peter@threeroomspress.com or call 212-731-0574.